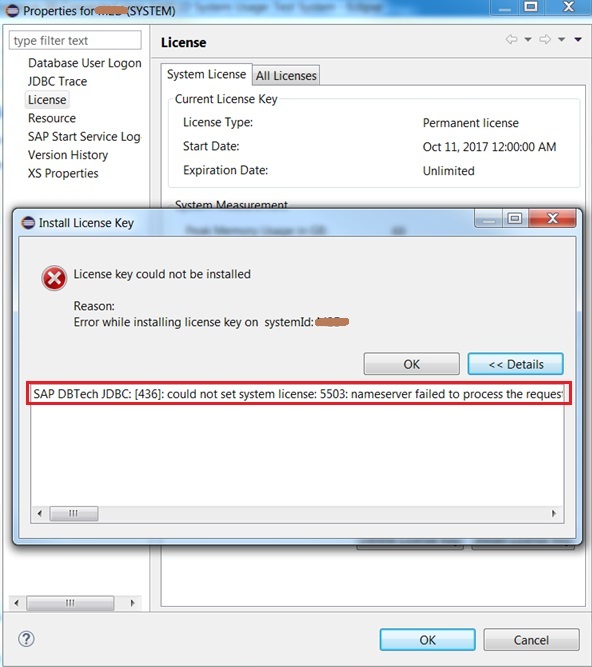 Error: You face an error in HANA Studio/HDBSQL “License key could not be installed” on SAP HANA DB while installing license on existing DB already running with permanent license. 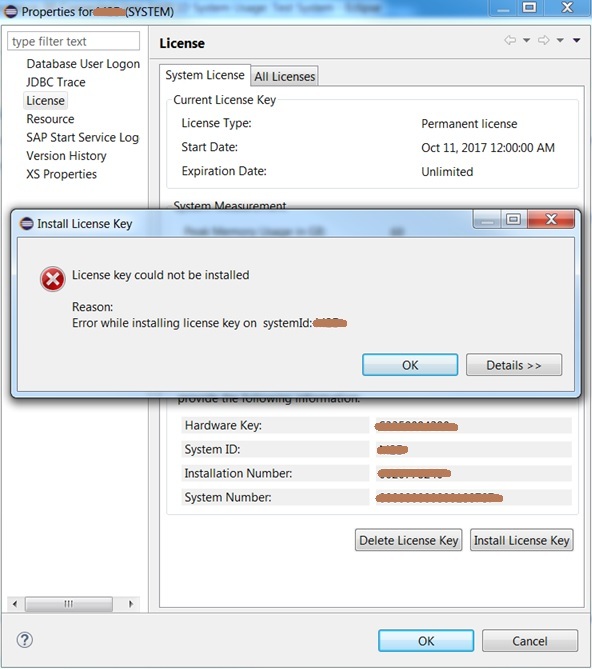 Cause of the error / Requirement: You may have to change installation and system number with new license request as old one was incorrect or system was configured under wrong product/environment in SAP Service Market Place. Above error occurs when you are trying to install HANA DB license with new and different installation and system number than one in existing license. Issue occurs irrespective of hardware key whether it is same as of existing license or a new one. 1. To avoid this error and to successfully install new license, you must first uninstall old license with HANA Studio or HDBSQL. Note: Before you uninstall existing permanent license on your system, keep in mind that this would put your HANA DB in lockdown mode temporarily. In lockdown mode, no queries are possible. Only a user with the system privilege LICENSE ADMIN can connect to the database and execute license-related queries, such as, obtain previous license data, install a new license key, and delete installed license keys. What it mean is your SAP Java instance like ME/MII running on HANA DB would crash if not shutdown beforehand. SAP ABAP instance would go in to reconnect mode and connect back as soon HANA DB comes out of lock mode. 2. 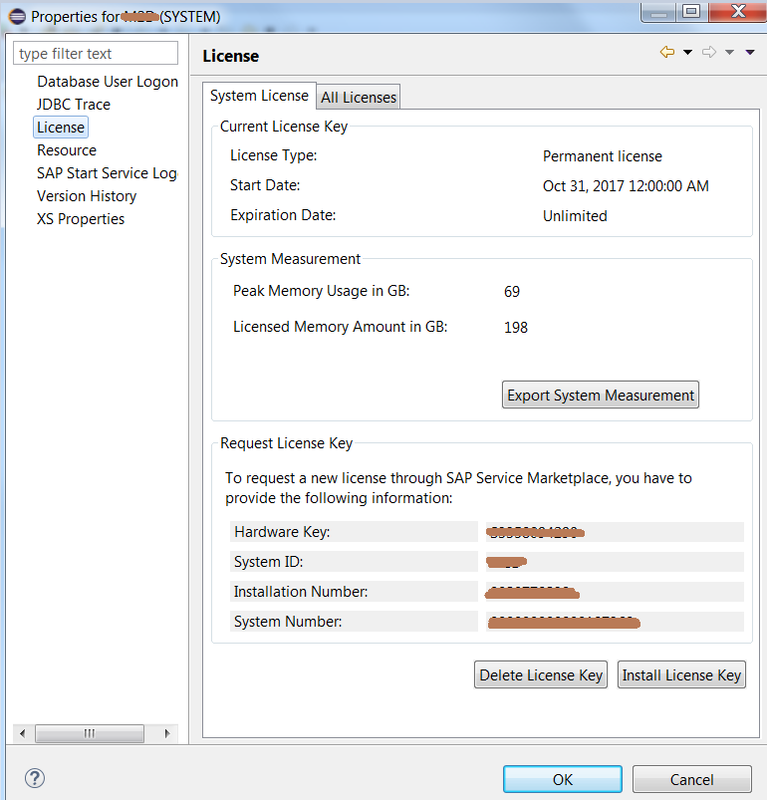 Install license with new installation and system number using HANA Studio or HDBSQL. It should work this time and HANA DB would come out of lockdown mode immediately.